A celebration of the most influential and thought-provoking speeches that have shaped the world we live in. With comprehensive, chronological coverage of speeches from the 20th and 21st centuries, taken from all corners of the globe, entries all feature photo headshots of the speakers plus an introduction explaining the background behind every speech and biographical details of each of the speakers as well as analysis of each speech throughout including buzzwords, memorable phrases and marginal notes. A collection of 50 of the most significant speeches from around the globe that demonstrably changed the modern world and analysis into the impact they had. Throughout history, great speeches have produced great change. From inciting violence and asserting control to restoring peace and securing freedom, nothing has the raw emotional power of a speech delivered at the right moment, in the right place, with the right content, and the right delivery. 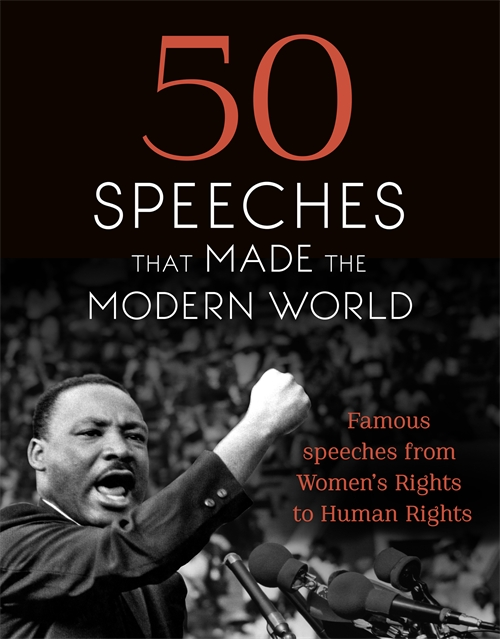 50 Speeches That Made The Modern World is a celebration of the most influential and thought-provoking speeches that have shaped the world we live in. With comprehensive, chronological coverage of speeches from the 20th and 21st centuries, taken from all corners of the globe, it covers Emmeline Pankhurst’s patiently reasoned condemnation of men’s failure to improve ordinary women’s lives in 1908 through speeches by Vladimir Lenin, Mahatma Gandhi, David Ben-Gurion, Albert Einstein, Fidel Castro, Nikita Khrushchev, Ernesto ‘Che’ Guevara, Martin Luther King, Malcolm X, Nelson Mandela, Benazir Bhutto, Osama Bin Laden and Aung San Suu Kyi, right up to the most compelling oratory surrounding the 2016 US Presidential elections. Through the rallying propaganda speeches during World War II to the cautious rhetoric of the Cold War period, through challenging the status quo on issues of race, gender and politics to public addresses to the masses on the issues of AIDS and terrorism, through apologies, complaints, warmongering, scaremongering and passionate pleas, this book delivers the most important speeches of the modern era and why they still remain so significant. Speeches are printed in full and chronologically arranged in a smart, open design. Featuring photo headshots of the speakers, each speech has an introduction explaining the background behind every speech and biographical details of each of the speakers as well as analysis of each speech throughout including buzzwords, memorable phrases and marginal notes.